We now turn to an extended example showing how an application can be written in C to be used with WAVE . The application is an example only; it is not intended for any serious application, clinical or otherwise. Its structure illustrates, however, how a real application can be built. As noted in the previous section, changes in the ST segment of the ECG are of interest because of their relationship to ischemia (which occurs when the oxygen supplied by the coronary arteries is insufficient to meet the demands of the myocardium). Characteristically, ischemia affects the shape of the ST segment, which corresponds to the first phase of ventricular repolarization following the QRS complex; typically, the ECG signal may not return to its baseline, or isoelectric, level (defined in the interval between the P-wave and the QRS complex) until after the T-wave. The level of the ST segment relative to the isoelectric level is the ST deviation. Conventionally, the ST deviation is measured at a single point 80 milliseconds after the J point (the end of the QRS complex). An ST deviation of 100 V is considered to be clinically significant, and consistent with ischemia. Here is the C source for the program. If this looks unfamiliar, read about how to write WFDB applications in the WFDB Programmer's Guide. Depending on how the WFDB Software Package has been installed on the WAVE host, you may need to use -I/usr/local/include and -L/usr/local/lib options so that the compiler can locate the *.h files and the WFDB library. On some systems, the C compiler may have a different name, such as gcc. Consult an expert such as your system administrator if in doubt about compiling a C program with the WFDB library. which should produce a brief summary of its options. If this test fails, figure out why and correct the problem before continuing. If you now reread the menu and use the new button, plot2d opens a window with a plot in it, similar to figure 3.5. 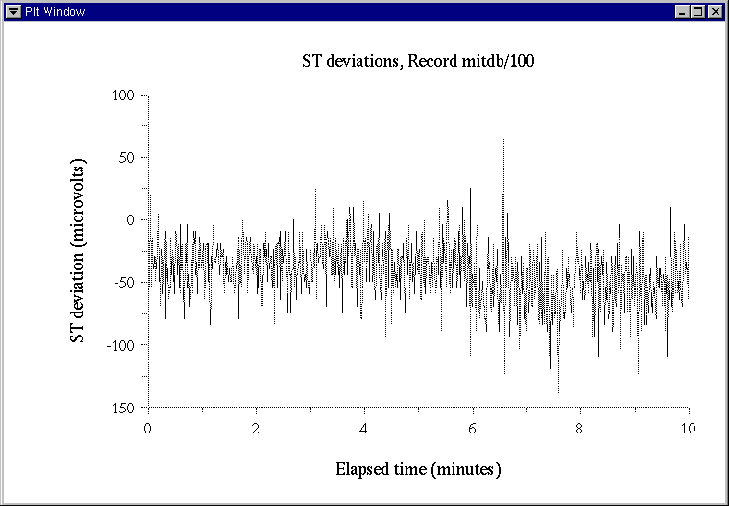 Figure 3.5: ST deviations measured by the example program. (To make this plot, I used the first ten minutes of record mitdb/100; the sample record 100s contains only the first minute of data shown in the plot.) This window stays open until you dismiss it by pressing ( ) in the Analysis Commands window; if you forget to do so, the next command you run from the Analyze window will serve this function (but the command itself won't run, since plot2d, rather than the command interpreter, will have read the command string).